Star Wars (later retitled Star Wars: Episode IV – A New Hope) written and directed by George Lucas was released in theatres in the United States on May 25, 1977. It earned $461 million in the U.S. and $314 million overseas, totaling $775 million to become the highest-grossing film of all time until the release of E.T. the Extra-Terrestrial (1982). 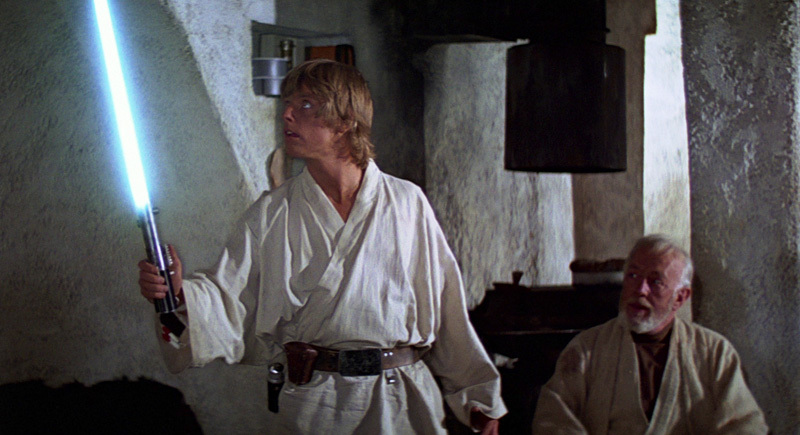 "It's your father's lightsaber. This is the weapon of a Jedi Knight. Not as clumsy or random as a blaster. An elegant weapon, for a more civilized age." "Your father wanted you to have this when you were old enough, but your uncle wouldn't allow it. He feared you might follow old Obi-Wan on some damn fool idealistic crusade like your father did." Looking closer into the construction of the lightsaber used in the original Star Wars movie reveals an interesting detail - the "bubble lens" of a Texas Instruments Exactra 19 calculator! This lightsaber originally belonged to Anakin Skywalker and was passed on to his son Luke by Obi-Wan Kenobi. It is of course made from the most well known Star Wars prop part, a Graflex 3-cell camera flash. This antique flash mounted on the side of a Graflex large format camera commonly carried by press photographers in the 1940's. Seven 3 5/8" long black handgrips were added to the bottom half of the flash. The exact identity of the grip material has yet to be determined, but recent revelations suggest hard black plastic T-track from old cupboards with sliding doors. In the middle of the flash is the mounting clamp that attached to the camera. Slid into this clamp is a Light Emitting Diode (LED) display bubble type lens from a vintage calculator. These lenses are 2 inch long clear strips with a row of convex lenses referred to as "bubbles" to magnify the glowing red LED numbers. The lenses used on the lightsaber props had seven bubbles. Very few calculators have 7 bubble lenses so far only three models are known, the Exactra 19, Exactra 20 and the TI-2000. These were introduced by Texas Instruments in 1974 and are referred to as 6 digit displays (only six of the spaces are used for numbers, the leftmost is for modifiers like a negative sign). Exactra 19 Most likely all Exactra 19 calculator use COB Technology. Exactra 20 Change from Single LED Modules to COB Technology on or around July 1974. TI-2000 Evidence for COB Technology still missing. Exactra 21 Change from Bowmar Opto-Stick to COB Technology on or around February 1975. Exactra 22 First Generation Bowmar Opto-Stick from October 1974. © Joerg Woerner, January 3, 2018. No reprints without written permission.